A well-balanced Plant Strong diet may reduce the risks of many chronic diseases like heart disease, high blood pressure, diabetes, obesity, digestive disorders and cancers. The food choices you make can directly impact how you feel and your health. This healthy and tasty main dish made with Cannelini Beans & Escarole Spaghetti Squash will be served on Saturday, Nov. 10 at the Seed Food & Wine Festival. Stop by our booth and enjoy! Slice spaghetti squash horizontally and scrape out the seeds with metal spoon. Rub squash all around with olive oil. Sprinkle the inside with sea salt and ground pepper. Place skin side up on a sheet tray and bake in a preheated 400˚ oven for 20 – 25 minutes (depending on size – you do not want to overcook). Then use a fork to shred the squash into pasta bowls. Sauté onions and garlic in olive oil, on low heat in small stock pot. Once tender add the optional vegan sausage and sauté for 8 – 10 minutes, or until sausage is cooked thoroughly. Then add tomato paste, incorporating well. Add the tomatoes, vegetable stock, escarole and cannelini beans. Bring to a simmer for 8 – 10 minutes. Serve on top of roasted and shredded spaghetti squash. Top with vegan Parmesan cheese and red pepper flakes (optional). Nutritional Information (per 1/2 cup serving): Calories 315; Fat 14 g; Saturated fat 2 g; Sodium 763 mg; Carbohydrate 35 g; Protein 17g. 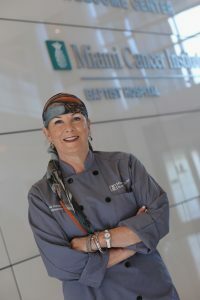 Chef Cindy Hutson is the celebrity chef/culinary ambassador for Miami Cancer Institute. For over 20 years Chef Cindy and her partner Delius Shirley have built a culinary empire with the successful opening and operation of more than eight award-winning concepts. Currently, they run their 17-year old Ortanique on the Mile in Coral Gables, Florida, which opened with Esquire and Bon Appétit acknowledging it as one of the “Best New Restaurants” and Condé Nast Traveler awarding it as one of their “Hot Table” concepts. Chef Cindy also shares her culinary expertise with the community, mentoring young women through the James Beard Foundation’s Women in Culinary Leadership program.